Caity Mattinson opened the scoring for Jo Yapp’s side, but two superb tries from Sophie Shams and Lydia Crossman put Durham ahead. Exeter hit back before the break as England U20s’ Hollie Cunningham crossed, but the Green and Whites fell behind immediately after the interval as Crossman scooted over for her second. Exeter showed their resolve once more as Lilly Stoeger-Goddard bumped off a tackle to finish in the corner before Clara Nielson dotted down from close range. Shams did grab her second try to reduce the deficit to a single point, but Lagi Tuima’s late penalty clinched consecutive titles for Exeter. With head coach Yapp departing Exeter at the end of this season, her side gave her the perfect send off in the sunshine at Twickenham. Exeter arrived at England HQ having not lost since October 2017 and the holders got off to an excellent start as Bristol Bears’ Mattinson barged her way over by the posts after great work up front. Durham, who had won all 12 of their matches this season prior to the final, replied quickly as player of the match Shams produced a wonderful turn of pace which allowed her to weave past numerous Exeter defenders to cross the whitewash. Both sides were playing their part in a fast-paced first-half and after Tuima had added a penalty for Exeter, Durham went 14-10 in front when Shams produced another storming run before the ball found its way to the impressive Crossman who smashed her way over the line. But Exeter managed to move ahead by half-time as Cunningham drove over from a line-out to give her side a 15-14 lead at the break. The seasaw nature of this final continued just two minutes after the restart as Crossman charged through following a lovely offload by Beth Blacklock, but Stoeger-Goddard provided an instant reply after Exeter had worked the ball wide. The Premier South champions put themselves back in front once again as Nielson, who scored a hat-trick in last year’s final, rumbled over to give her side a 27-21 advantage. Durham once again rustled up a response on 73 minutes as Shams was helped over the line by Crossman, but Cameron Henderson’s side were unable to convert. 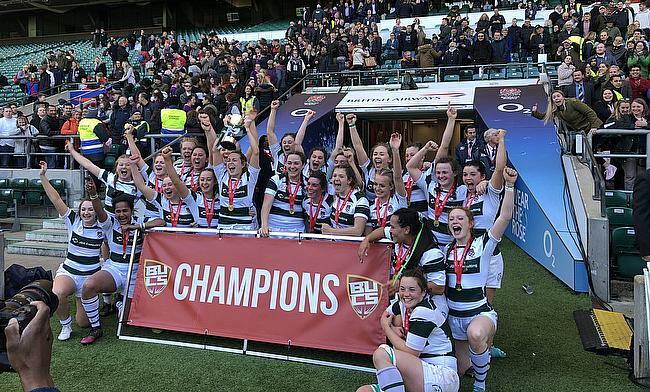 Instead, Exeter showed their experience in the latter stages and worked their way towards a penalty which Tuima duly converted to seal Twickenham glory for the second year running. University of Exeter: Cat McNaney; Lilly Stoeger-Goddard, Lagi Tuima, Kirsty Exley, Zoe Heeley; Hannah Gascoigne (capt), Caity Mattinson; Jessica Thomas, Jasmine Jeffreys, Jeanine Stephenson; Jenna Claridge, Hollie Cunningham; Poppy Leitch, Clara Nielson, Sian Jeffreys. Replacements: Charlie Budge, Kiki Kemp, Katie Leitch, Ebony Jefferies, Emily Foster-Godley, Tuesday Platt, Kim Grundy. Durham University: Sophie Shams; Anabel Lee, Coreen Grant, Beth Blacklock (capt), Lydia Otulakowski; Erin Kelly, Caitlin Sedgeworth; Eszter Pinter, Natalie Kidd, Sarah Ward; Roshini Turner, Trudy Cowan; Lydia Crossman, Tania Forichon, Heather Kerr. Replacements: Emma Sands, Rachel Catterall, Taina Puddefoot, Olivia Davison, Josephine Ellis, Lydia Harris, Katie Moran. Make sure you also take a listen to our #BUCSFinals Day podcast from Twickenham!